Oops - we don't appear to have a video for the Scanjet Pro 3000 s2. Quickly store and share your scanned files with ease - send directly to cloud storage or a SharePoint site. Breeze through processes with fast scan speeds and a 50-page automatic feeder. Turn your files into editable digital text with included Readiris Pro 14. Save time with automatic two-sided scanning. Reliably handle a variety of paper types,thicknesses,and sizes. Convert papers into searchable,editable files. Save time and skip steps with HP easy scan. Create quick shortcuts to help add efficiency to your business. 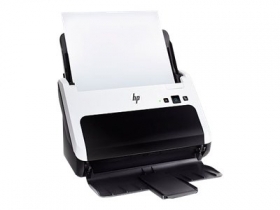 HP easy scan allows you to automatically and accurately capture the right results with auto-scan mode,crop,and color detection. Create PDFs with a touch of a button. Avoid missing pages in scanned files - HP EveryPage Ultrasonic feeds one page at a time and scans mixed documents of different sizes. Produce sharp,legible results with the ability to scan at 600-dpi resolution. Rely on a scanner that just won't quit - scan up to 1000 pages per day. Preserve workspace with a compact device that fits in around the office - close at hand or out of the way.